I have just arrived home from an amazing week in Cassis. Cassis is located in the South of France along the Cote d'Azur. Cassis has been described as a secret and undiscovered area of France, and it is certainly one of the most beautiful places that I have ever been to. As you can see from my photographs, Cassis is such a beautiful Mediterranean fishing port that is full of life. I am creating a short blog series of my week in Cassis. For part two, in this blog post, I am going to share with you the best places to eat in Cassis! Le Chaudron is a beautiful restaurant located in the centre of the town in a small alley metres away from the village square. It specialises in speciality dishes from Provence including La Boulabaisse. I am not really a fishy fan so I wasn't tempted by the local dish of a special fish stew... instead I ordered a pasta dish with a pesto-like sauce and parmesan cheese. The pasta was so delicious, and the location added to the lovely atmosphere. My Grandad ordered the prawn dish, and when it arrived it looked amazing. My whole family was very happy with their meals. Of course, because we were in France, we were given some free baskets of bread to go with our food. For dessert I shared some profiteroles with my mum, and they looked and tasted amazing! Overall Le Chaudron was a delicious restaurant that offered a wide range of french and mediterranean food, great atmosphere, and was located in such a beautiful setting. The waiters and waitresses were so friendly and helpful, and the prices weren't too expensive either. Another amazing restaurant in Cassis. Situated along one of the back alleys in the village, it seems like you are eating on a movie set. The food was very delicious. We opted to order of the set menu which was great value for money. This time I ordered a starter and had a selection of local hams with salad. I originally wanted to order the mussels in white wine sauce, however there was only one more left so I allowed my Grandad to have it. The selection of hams was nice, but nothing really special - however my Grandad really really enjoyed his mussels! For my main dish I ordered the salmon fillet coated in poppy seeds with a pesto sauce (clearly I love pesto ordering it two nights in a row...). It was cooked perfectly, and served with delicious roasted potatoes and vegetables. Overall Le Bonaparte was a lovely restaurant that had a delicious set menu that was very affordable. Again the restaurant had a idyllic location, and the staff were so friendly and attentive. On the Wednesday it was my step-dad's birthday so we booked a meal at the Yacht Club de Cassis, which was recommended to me by the owner of the bed and breakfast Maud. It was another different but beautiful restaurant setting across the harbour - it was so pretty especially when the sun began to set over the sea. There was lots of variety on the menu. I had a salad to start with toasted bread and Chauvre which is a delicious warm French cheese. For my main I was craving a meaty dish so I opted for a burger. It was so delicious, and certainly filling. As it was my step-dad's birthday my sister and I decided to treat ourselves to a dessert which was a Nutella waffle with ice cream. It was so deliciously sweet and chocolatey. Overall the Yacht Club de Cassis is a brilliant restaurant for an evening meal, but also a filling late lunch. The staff were so lovely, and the food was amazing quality. It was definitely my sister's favourite restaurant of the week. The location of the restaurant overlooking the harbour was definitely the biggest selling point of the restaurant! I started talking about this vineyard briefly in my last blog post, but this was one of the highlights of my holiday in Cassis. On Thursday night we made our way across from our accommodation to the vineyard called Le Clos de l'Albizzi. Every Thursday evening the vineyard lays on a lovely little restaurant/bar in the middle of their courtyard. 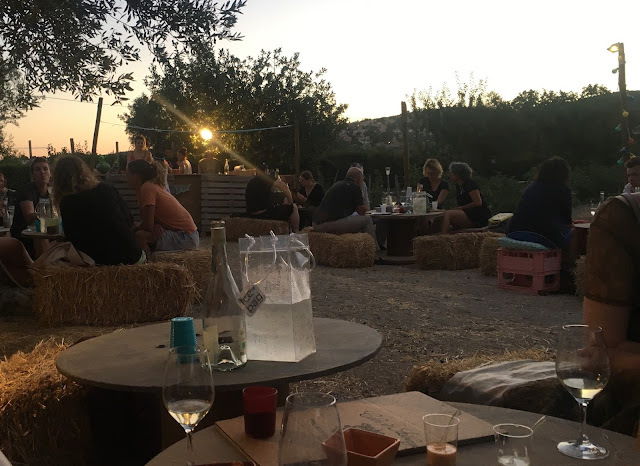 The small scale restaurant is run by a group of young girls who have perfectly created a unique dining experience in Cassis. We arrived to see lots of pretty tables put out with hay bales which had cushions and blankets on them, and lots of twinkling lights. It looked so countryside-esque and frenchy! We sat down to order some tapas and camembert to share between us, as well as some white wine and rose wine which had been produced at Le Clos de l'Albizzi. It was so pretty and idyllic, especially as the sun set in the distance. The food was very enjoyable, and the wine tasted delicious. I loved the whole atmosphere in particular, and I talked to some lovely local people. It was such a lovely experience, and one of the most unique nights I've had whilst on holiday. Nominated the best pizza restaurant in Cassis, this was certainly my choice of restaurant to try out. The restaurant is so popular in Cassis we struggled to book a table, and had to book a late meal at 9.30pm. However we decided to go for some drinks along the harbour to kill time before our meal. 9.30pm soon arrived and we made our way through the winding back streets to sit down at La Girandole. We were lucky to have a seat outside in the pastel-coloured streets, and I had a lovely view that looked down an alley to the harbour that was all lit up for the evening. I must admit the service was very slow that evening, however they were very busy in particular that night and the staff were very friendly and apologetic for the wait. Of course being in the best pizza restaurant in Cassis, I had to order some pizza. My aunite and I decided to share two pizzas between us because we couldn't choose between two topping types. We opted for the Cremiere pizza and the Quatre Fromages pizza. The pizza arrived and they looked absolutely amazing. Both pizzas tasted delicious, and they were made on a proper Italian pizza base. My nan said that it was possibly the best pizza she had ever eaten! As it was our last evening in Cassis we treated ourselves to a slice of chocolate cake to finish off the meal. The food at La Girandole was so delicious and I would certainly recommend the restaurant to anyone staying in Cassis. The range of choices available was brilliant too, and the location was beautiful. However the best thing about La Girandole is the affordability of the food. An average pizza was about 11 euros, and half a bottle of rose was only 3 euros, whilst the quality of the food and drink was still amazing! Obviously there are lots of wonderful places to eat out in Cassis, and there is definitely something for everyone. The quality of the food in the area is incredible, and the settings of the restaurants are all beautiful. If you are planning on eating out in Cassis, you are certainly in for a treat wherever you go!